HW2 Technology & TOURMALINE gives NEW styling brand ego its powerful ability to detox, de-stress and de-frizz hair leaving it polished, healthy and manageable. 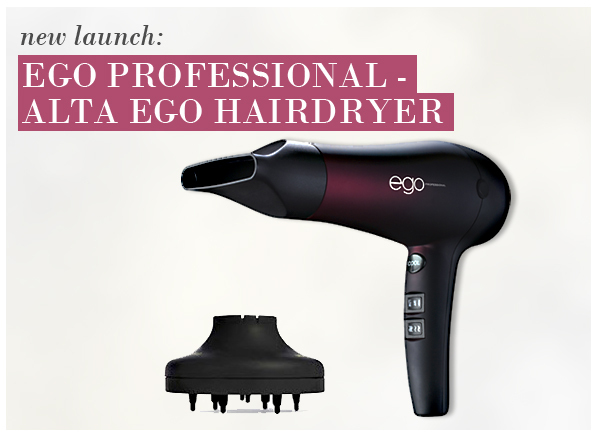 ALTER EGO – is Ultra Lightweight Dryer has no less than 8 heat and speed settings make this ergonomic dryer the ultimate in efficiency and usability. The generous 10 foot cord, strong but light design and diffuser gives you real freedom while its powerful 2000 watt motor puts you in complete control. The dryer is packed with HW2 technology to improve hair quality and manageability in next to no time. Tourmaline naturally emits negative ions and far-infrared heat waves when heated or put under pressure… it was perfect for use in hair styling. HWANGTO, the secret of the East. Matured for approximately 4,000 years in the red pine forests of the highest mountains in South Korea. The main surface of HWANGTO consists of a wide double construction something like a honeycomb, the inside of HWANGTO has the maximum number of useful minerals emitting lots of negative ions, far-infrared rays and antibacterial properties when affected by a high temperature. HWANGTO CERAMIC contains one of the most unique elements called KATALRAJE. This helps emit the greatest number of far-infrared rays and ANIONS in nature. There are approximately two hundred million beneficial organisms in one spoon of HWANGTO ceramic, including 4 kinds of enzymes for removal of toxins, humidity control and air freshening. Continuous use with hair tools that don’t have TOURMALINE & HWANGTO will gradually make the hair frizzy, dry and out of condition. Chemical, mechanical and environmental elements damage the cuticle. However the damaged cuticle is repaired to fantastic condition by HWANGTO ceramic far-infrared rays and negative ions. This entry was posted on Tuesday, July 13th, 2010 at 10:28 am and is filed under Haircare. You can follow any responses to this entry through the RSS 2.0 feed. You can skip to the end and leave a response. Pinging is currently not allowed. Good info, a lot of thanks towards author. It’s incomprehensible to me now, but in general, the usefulness and significance is overwhelming. Thanks once more and great luck!